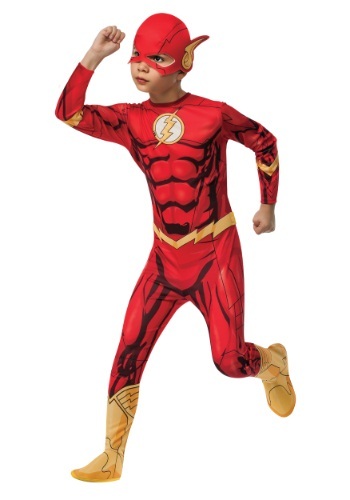 This Classic The Flash Costume lets your child look just like the 1950s Flash, Barry Allen, who can tap into the Speed Force and become the fastest human ever Your child might have to do some training to get that fast--we're assuming you don't have electrified chemicals in your home. You've always thought that he was pretty speedy for his age, but he won't have a chance of breaking land speed records until he has a lighting bolt on his chest! 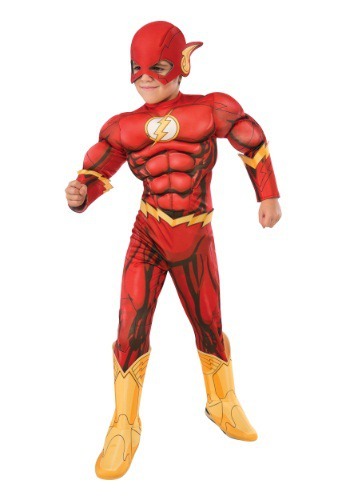 Set him up with this Flash Costume, and he'll be ready to whiz around in a hurry. With faux muscle accents and classic styling, he'll be ready to save the day at the big costume party. And if you run out of chips, he'll be able to get down to the corner store to re-up in a "flash!" How much energy does your kid have? Does he have a suspicious fuel left in the tank after playing all day long? We have a theory. He may have just started to learn how to tap into the Speed Force! Barry Allen tapped into to it to become The Flash and now, it may just be time for the mantle to your child. With this costume at the ready, when his Speed Force superpowers start manifesting in the full, he'll be ready to do battle with bad guys just like in the comic books. Of course, it may turn out that your child a normal child with tons of energy, but we're hoping he's a superhero in the works! Girls are actually perfect candidates for being super heroes. They can handle the pressure of having super powers and unlike boys, rarely use them to get into trouble! If you have an inkling that your kiddo would be best suited for super speed, let her go in this Flash Tutu Costume. It's super cute with heavy dose of glitter, so even if she doesn't have the power of super speed, at least she'll look the part! Is running really fast sort of your kid's thing? Running really fast is the Flash's thing too. The only difference between your child and Barry Allen, is that he wears a spandex suit that makes him look super-cool while he runs and he fights crime while speeding around. We can't really recommend sending your kid out into the world wearing nothing but a spandex suit, although we can recommend this costume hoodie, modeled to look like the famous DC hero's costume. We're pretty sure all the lightning bolts on it make it extra aero-dynamic and allow your kid able to channel the Speed Force, but we're not physicists, so don't quote us on that. Tests have shown that a lightning bolt on your chest makes you run faster. By tests, we mean that we had Jim from customer service put a Flash costume t-shirt on and he thought that he ran little faster than normal in it. We can't prove that he actually ran faster, but we're pretty sure that he looked 10 times cooler doing it. (Actually, we can't prove that either). Cooking isn't easy, but when you're the Flash it happens microwave fast. He fires up the grill, puts a steak on the rack, and BOOM it's done; cooked to perfection. Now, that's the real superhero... your results might differ. 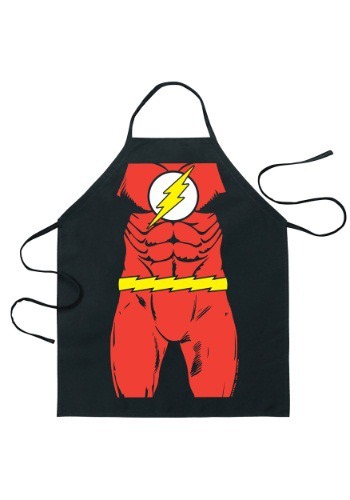 When you wear this Flash character apron we can't guarantee you'll be able to cook with superhuman speed but you'll look incredibly heroic while you flip that meat.